Well the time has come to share my last projects that I made for the Hey Little Magpie Creative Team a few weeks back. All the details can be found here on the blog. So many possibilities with these collections, but I sat down first to use the Sugar Plum collection. How sweet is the glass dome ornament in the ephemera pack? I have a bit of a weakness for glad dome ornament and little cardboard glittered decorations in real life so it's even nicer to be able to use these on cards too! Next up the pompom trim came out to play! I love any excuse to feature mini pompom trim on Christmas cards, it's just so festive, and a great way to separate contrasting paper patterns. I twinned the candy cane ephemera with this lovely greeting from Avery Elle. There's always time for a clean and simple design - just love the geometric pattern in this collection - great shades of red through pink make for a really bold background to white space. I simply added a star from the enamel shapes to one of the ephemera trees and a stamped greeting. Another thing I have missed using on cards has been seam binding - it adds a little vintage flare! For this card I simply added tags from the ephemera pack, including the large Joy tag, and the festive little deer. I stamped a greeting onto this banner from the ephemera set. There had to be more glitz added right? So out came the Frosted Lace Stickles for some sparkling snow on the houses. And for an extra festive pop, I created a tinsel-like background for the greeting. For this card I wanted to use some of the left-over wintry scene paper to create a kind of snow globe look. I added elements from the ephemera pack to bring it all together. And now to Comfort and Joy - lots of cosy patterns and stand-out elements in this collection! I particularly love the tartan plaid designs. I totally love the marquee-lighting style elements in the chipboard set for this line. The star really pops against the patterns in the background - even more so with the addition of the stitched circles from the Lil' Inker Designs silly stitched die. There are also some bolder designs with a black background. I found the perfect greeting for this card in the form of one of the journaling cards from this collection. Love the contrast of the tree against the woodgrain. Next up another wintry scene! When I saw this sledge in the chipboard set I knew who would be receiving this card! And of course I had to pair it with the Memory Box Country Landscape border die! Up over on the Hey Little Magpie blog I'm sharing Part 1 of my Christmas Card Production 2016 - it's mid October, so really I need to be stepping it up a gear if I'm going to have enough cards by December! I've used the lovely new festive releases from My Mind's Eye for these cards: Sugar Plum (which is all vintage-y gold glitter and pastels) and Comfort and Joy (lots of plaid, wood, and cozy prints). You can see my projects here on the blog. Sadly this is my last set of projects for the Hey Little Magpie Creative Team. It's become a challenge to keep all the plates spinning the last few months and my crafting time took a real hit. 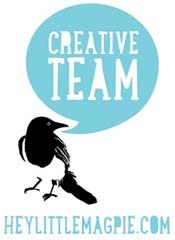 The past two years on the team have a great ride and I'll definitely be around on the Hey Little Magpie chat and inspiration group on Facebook and look forward to joining in with more challenge weekends! I hope you enjoy these projects. Well it has been a while since I shared some card projects so what better time to update the blog with my Hey Little Magpie projects from last month using the Birthday Bash collection by Pink Paislee. As always, the full details can be found here on the Hey Little Magpie blog. Got to love the giant birthday presents in the die-cuts - fab as the centrepiece on a card. I just added a tiny tag and sentiment plus the Mama Elephant bow! This simple card features one of the cut apart journaling cards which has this copper foiling on it. No birthday is complete without some balloons! I layered up two of the tags from the ephemera pack and sewed them together then added extra bling to complement the rosette. One of my favourite papers in this collection was this black spotty paper. Perfect for accenting the dots with Nuvo crystal drops. This was my first time using this product and I was very impressed with the end results. And finally, a very special OTT bling-filled card for a certain 4-year-old's birthday! I made this concertina card to look a bit like a banner. I split the rosettes apart so that the jewels could be used at the top and the rosettes could be used as a background to the number and letters. Happy to report the birthday girl loved it! Phew! Well I am crawling out from under the work-related rock I've been existing in for the past 10 days or so as the light is finally shining at the end of the tunnel for the project I am currently working on! Hooray! It also means I really need to catch up with sharing my Hey Little Magpie projects from the summer. Where on earth has the time flown to? So anyway, back in August I had opportunity to craft away with the fantastic Hooray collection from My Mind's Eye. It's a lovely line and packed full of fun colours and designs that work great together and will also nicely integrate into my other stash for future card projects. The full details can be found here on the Hey Little Magpie blog. So on with the photos! I mean look at the beauty that is that striped diagonal rainbow of lushness, so glad it's included in the 6x6 pad and there are two sheets to use up! The stickers in this line are just the perfect size for stand-out card projects. How cute is this banner? Another stand-out feature is the rose gold foiling. I used the fab sunburst-style 12x12 paper for this card - so effective! Love it paired up with all the party ephemera. I finished it off with dots of paper from the ephemera pack that I scored so they would pop out more. I used a journaling card as the background for my greeting on this card - just love that candle design. And once again my Neat and Tangled die set for scored shapes came in nice and handy for adding a few little finishing touches. It's great that this collection also includes some nice elements for sending thank you cards. I went to town with my remaining banner elements from the ephemera pack for this last card. So all in all, lots of crafting fun to be had. I'll definitely be reaching for this collection again when needing to top up my birthday card stockpile! Head on over to the Hey Little Magpie blog today to see my new projects using the Birthday Bash collection from Pink Paislee! The challenges posted this weekend on the Hey Little Magpie Chat & Inspiration FB group are still open for you to join in. The deadline for all entries is midnight Friday 23rd Sept! I went with the elements of birdies, a tied on tag, doily, and a pop of aqua blue. I simply couldn't bear to cover any more of that Kindred paper from the new Maggie Holmes Gather collection. It is just gorgeous! And speaking of gorgeous, it's been quite an eventful 24+ hours in our family. I will try post more tomorrow when I have more time but yep, happy, happy times! There's crafting fun to be had this weekend with the Hey Little Magpie team - get ready for some challenges and inspiration to get you in the crafting mood! I hadn't realised I'd not shared these card projects on my blog yet, but back in July(!) I was busy crafting away with the lovely Sunny Days collection by Elle's Studio. As always the full details can be found over on the Hey Little Magpie blog. Right, on with the projects! I love the star background paper in the 6x6 paper pack for this line. I couldn't resist adding more stars! Lots of rainbow colours in this line too - they are lovely paired up with the ephemera die cuts. The 12x12 wave paper in this line makes for a great backdrop to a pirate card. There's plenty of scope for birthday cards for boys and blokes too - I love the combo of the ephemera star and layered up sequins. I'm back on the Hey Little Magpie blog today sharing some new card projects with the awesome new Hooray! collection from My Mind's Eye. Hey everyone! I've been back at my craft desk working on some fun new card projects using the fab Sunny Days collection by Elle's Studio. You can see them here on the Hey Little Magpie blog! Last month over on the Hey Little Magpie blog I got to play with the gorgeous Free Spirit collection by Cocoa Vanilla Studio. Lots of lush colours and details in this collection including some great ephemera, puffy stickers and cardstock stickers to go with the papers! Here's one of those puffy stickers in action, really love the brush style font and how the cut-apart journaling paper provides some nice accents and details for cardmaking too. You can see what a love collection of colours there are in the range - orange, aqua and hot pink are a favourite combo of mine! And I added a touch of bling with gold sequins. How could I forget to mention the stunning paper flowers also in this collection? The colours are so vibrant! I love the combination of vintage-y doily with puffy stickers and that lovely "Shine Bright" font from the ephemera pack - a perfect colour match for the Kate & Co. enamel dots from My Mind's Eye I still had in the packet. Another thing you know I love to use on my cards are frames, lots to choose from in the ephemera pack! For this card, I cut up lots of scraps into strips to create the background and simply stamped a greeting on one of the labels in the journaling sheet and added a few butterflies and crystals. I have some new card projects up on the Hey Little Magpie blog this month using the fab Free Spirit collection by Cocoa Vanilla Studio! What a lovely day it is compared to the weather extremes of yesterday. I thought I'd take a moment to share my Hey Little Magpie May projects from last week - the full details can be found here. I love the 6x6 pad from this collection as the paper designs are the perfect size for cards without being overly busy. Sometimes when 12x12 designs are shrunk for the 6x6 pads they can be too busy, which is why I usually always buy the 12x12 sheets from collections. But on this occasion the 6x6 pad is the better option for cardmaking. On this card I combined papers from the 6x6 pad with the 12x12 version of the spotty paper. I used as Simon Says Stamp Christmas die to cut the "Happy" from the paper and used 3D foam tape to attach coordinating colours of cardstock behind them. This card was made with left-overs I'd cut from other papers in the collection that were on my desk. Just a bit of snipping with my scissors and voila! A nice fringe trim. All that was needed was a sentiment and little chipboard button. This card was a very simple one - all the elements are from the collection, I just added the punched butterflies from the scraps of the pink ombré paper to bring everything together. And then there were some project life pages - I am so behind on my 2014 album, but I had the photos ready to scrap and thought this collection would work great with them, especially the lime green June insert from my desktop calendar that I'm using to mark the months in this album. Much of June was about our family trip down to Cornwall for my cousin's fab wedding and we also got in on some of the wedding prep too. Pompom assembly and my dad very much enjoyed the sit-on mower that was put into action to clear space for cars. My main project was to use some hand-sewing on the awesome #02 paper. It involved a trip to Hobby Craft to invest in some nice matching shades of thread! I really love how it turned out against the desktop calendar insert. This time using the circles from the 12x12 sheet and more hearts and stars cut from scraps. They go so well with journaling stickers from Pinkfresh Studio's Felicity collection plus Simple Stories Life in Color. I also used a cardstock tag from the collection to add a little pop on the calendar insert. Well, I'd best sign off - need to head on over to my mum and dad's soon to assist with the painting and decorating. Well, it's a new month and I am determined to get back on track with behind the scenes organizing, etc. So first up, time to share my April card projects for Hey Little Magpie - the full details can be found here. So on with the card projects! I loved how the banner tag in the Hillside tags pack was the perfect size for what is often too big a greeting for my regular cards. Nice to use that Avery Elle sentiment stamp again! Once again the sheet of journaling cards in this collection provides some nice backgrounds and accents for cardmaking. I used a circle die to really make the words of the black journaling card pop. For this card I took the little bird from the Saturday Morning ephemera pack and combined it with some feathers from the Hillside foliage die-cuts. It wasn't until after I photographed the card that I realised those feathers looked like a big tail on the bird! Well before the month is out I'd better share the card projects I made for Hey Little Magpie this month using the Spring Fling collection by Pebbles. I used the lovely gold foiled cutout journaling cards to make this card, plus some of the little stickers on 3D foam for extra pop. For this card I used stickers from the 6x12 sheet plus one of the sentiment stickers from the sticker book. I finished it off with a matching button and twine. I used the lovely stitched and scalloped frame die from Mama Elephant for this card. The Easter die is cut from scrap watercolour paper that I use to test colours on, so there are some varied pink tones in it. The "wishes" comes from the sticker book - very handy! This is another simple one, just one of the cutout journaling cards framed in some light grey cardstock and a couple of dragonflies from the sticker sheet. This card features more stickers from the sticker sheet, plus a greeting from the ephemera pack. I love the end strips of decorative borders on the 12x12 papers as you get nice contrasting designs like the pink and white stripe here. Finally this last card uses the B-sides from some of the paper scraps I'd used earlier and some ephemera and stickers. Nice and simple! All the details are on my original blog post here. There are plenty of vibrant colours and patterns teamed up with lots of gold foil accents in this collection. I used a mix of paper from the 6x6 pad and the 12x12 floral sheet on this card and teamed it with the flowers and journaling card from the ephemera pack. The little banner and heart are from the sticker sheet and the enamel dot was from the same collection. Clean and simple works so well with this collection. I just loved the 12x12 sheet of navy and gold foiled paper - you just don't want to cover it up too much and it looks great with this journaling card from the ephemera pack. The Pale Rose Bazzill Cardshoppe cardstock is a great match for this collection - it's a lovely pink. And the Graceful Greetings stamps and dies by Papertrey Ink go beautifully in terms of the font but also the cutting around the stamped image using the dies. I used papers from the 6x6 pad on this card - yay, finally thought of a way to use all those gold pineapples! I also found a great sentiment stamp that would fit inside one of the stripes. Time for some gold overload! I used lots of accents from the ephemera set, plus a mix of 6x6 and 12x12 papers. The little Hooray banner is cut from the 6x6 version of the journaling paper. This little notelet card is covered in the journaling spot from the 12x12 sheet of paper. I added some stickers and enamel dots, but also used Glossy Accents to make the detail of the background design pop more. I used a couple of journaling spots from the 12x12 sheet on this card and layered them up. The "you" was cut from a stripe of patterned paper in this collection and I used my wink of stella pen to add some glitter sparkle. New projects coming to the Hey Little Magpie Blog tomorrow! Here's a sneak peek of what I'll be sharing tomorrow at Hey Little Magpie! I recently shared some ideas for gift tags with a difference over on the Hey Little Magpie blog using the True Stories die set by Shimelle. Accented with chipboard candles from the corresponding Thickers set from Dear Lizzy. I had to include a little heart on one of the balloons on this one. My trusty flower dies collected over the years came out to add a little floral accent to this get well tag. Making rosettes with mini cupcake cases is still something I love the look of! I doubled up the label dies in the True Stories set as a background to the sentiment for this one. And with a sentiment like this one, I had to get my trusty Lawn Fawn sunshine die out. Well, there was room to write a nice little message that only the recipient would see. I cut a label from grey and pink cardstock, but used the To:, From:, and heart dies from a Mama Elephant embellished tag die set to prep the tag for use. It was back to the cupcake wrapper trick for this one, complete with a 3D heart and banner cut from the die set. The Lovely die looks great when popped out against contrasting backgrounds. And finally, there had to be a card right? I used these lovely subtle papers from the Jen Hadfield DIY Home collection by Pebbles and combined the "Lovely" banner from the True Stories die set with the "hello" and heart from the Jen Hadfield Cottage Living die set. In other news I am hoping to have a crafty morning tomorrow and get caught up on some projects on my to-do list. I also need more practice with my MISTI tool! Not to mention there are a few card kits in my Raskog trolley needing some attention. Here's hoping Sunday is a good day for creativity! In the meantime I've soon got to zoom off for an afternoon of boardgames, followed by a meal and a movie. I hope you all had a lovely Christmas break. It's been pretty busy for me as not only have I spent time with family I've also got a doggy house guest and we've tried to be out in the (fleeting) good weather when possible. I also had some work the past few days and haven't had any chance to read my book pile let alone do some crafting! But that's ok, I have plenty of lovely product from my Christmas presents to play with in 2016. But before we see out 2015 I thought it was time I should share my last projects of 2015 for Hey Little Magpie! I've got plenty of elements left over from this collection, especially lots of glittery snowflakes, so will be putting them to good use for my Christmas cards in 2016. I hope you have a lovely NYE celebration tonight and a very crafting 2016! I have a flurry of new card projects over on the Hey Little Magpie blog today using this really cute collection by Pebbles! Snowmen, penguins and snowflakes abound! A few weeks ago I shared a new round of festive card ideas over on the Hey Little Magpie blog that featured some lovely papers and embellishments by Basic Grey - their Juniper Berry collection has to be one of my favourite Basic Grey releases of late, plus the B-side collection includes a couple of very handy neutral papers that mix well with the festive tones of Juniper Berry. The wood/natural patterns in this line are a great complement to the more colourful designs and accents. I used one of the journaling cards from the cut-apart 12x12 sheet of paper for my greeting and just dressed it up with a few accents, including dots of 3D glitter paint on the Ys. These cute designs together (especially the polar bear design) totally made me reach for the lovely Holiday Hugs stamp and die set by WPlus9 - the style of illustration is just a great match for these papers. One of my favourite papers in the collection may seem unremarkable, but it's like the ninja warrior of this collection! The green striped paper is great for die-cutting trees as in the bear card, for use on large areas of your background, or for cutting holly leaves. The two tones of green bring die-cuts to life and make them really pop! I love that woodland scene - so bright and cheerful and a really busy pattern that needs a bit of contrast. To make the scallops stand out more I added 3D foam tape under that bottom edge. I just love how versatile that aqua dotty paper is for making lovely little winter and Christmas scenes. Such a nice backdrop to that hill of wintry trees I created with the Lawn Fawn border die. I dressed up the frame and sentiment from the ephemera pack with with some festive holly leaves and berries, a snowflake cut from vellum and some jingle bells for extra merriment. I added a pop of sparkle to those neutral subtle tones with Stickles and gold enamel dots and then it was good to go! Over on the Hey Little Magpie blog today I've got some brand new Christmas card projects featuring the lovely papers and other elements from Basic Grey's Juniper Berry release. The full details for all the cards can be found via the blog link above. :) On with the photos! First up the cards using Elle's Studio Joyful - I just loved this collection. All my favourite colours for Christmas - the traditional reds and greens mixed in with vibrant pink and aqua tones. I absolutely love using the Lil' Inker tree die for this technique - and it looks even nicer with this bright and bold shades. Even with small star die cuts you can really make them stand out. Finally this card using Joyful features another favourite Christmas colour of late - grey! The tag and heart were from the ephemera pack and worked great as a greeting. Next there were a couple of random papers I picked for some festive projects. These next projects use papers, journaling cards, and ephemera from the two MME collections. I think the Christmas on Market Street papers are nicely balanced with light grey as a neutral tone. I used two Christmas on Market Street journaling cards as "paper" and used a Lil' Inker Designs stitched rectangle die for a little contrast. The sentiment and candy canes are from the Cozy Christmas ephemera pack. I really like this B-side pattern - a great neutral background to bright pops of red and darker greens. I die-cut the journaling card down with a Lawn Fawn die to get the stitched border and simply added a banner from the ephemera pack behind it to make it stand out more. I cut the floral ephemera apart so that it could be popped under the journaling card in places.